Do-it-yourself brides may want to learn how to make decorations like the crystal wedding tree. Popularized by top wedding planners like Preston Bailey, these stunning crystal trees are one of the hottest trends in wedding reception decorations. A basic crystal wedding tree is easy to make, even for the clumsiest of crafters. A do-it-yourselfer can make a number of trees quickly and easily. Metal centerpiece trees are the easiest for brides to make, because they do not require any work on the tree itself. Choose from black, silver, gold, or white painted metal trees. Once you have purchased the wire tree frame, you will need to buy crystals. Crystals can be any color you choose. 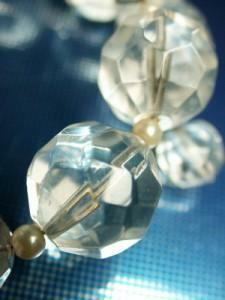 Brides often choose clear chains made of crystal, acrylic, or glass. Just about any color can be found, including black, red, green, blue, and pink, as well as colors to coordinate with the bridal party dresses or other wedding colors. Tie crystals onto tree using white satin ribbon or hang with small metal hooks in the same color as the metal tree. Use a lace doily or small hemmed piece of fabric underneath the tree on the table. Depending on the lighting of the reception room and exactly what you decide when learning how to make crystal wedding tree decorations, you could add a mirror beneath the tree, creating a stunning ambiance in the room. Making a wedding reception centerpiece crystal tree out of live materials requires a little bit more work. You need to decide if you want to use a small potted tree, bush, or branches in vases.A small potted tree or bush should be tall enough that guests can see across the table. You may have to cut bottom branches off the tree in order to make it work. A heavy pot or vase should be used to keep the tree steady. Paint or decorate it to match your wedding décor. Use branches in vases to make a crystal wedding tree quickly and easily. Take several branches without leaves and tie them together. A rustic outdoor wedding would call for natural looking branches, but a more elegant look would include spray painting the branches so they are one uniform color. Silver or white would make excellent choices. Place the branches in a glass vase and hold in place using rocks, sand, or glass balls. After placing in the vase, add crystal strands to the branches at various intervals. If you are planning an outdoor ceremony or outdoor reception, you can use the surrounding trees to turn your wedding into a crystal fantasy. Not only will you save money, but decorating will be a breeze. Large trees can easily accommodate long strands upwards of 6 feet in length. Hang the strands close together and place lighting near the tree so that it illuminates the crystals as evening approaches. Use potted trees (faux or live) between 4 and 6 feet tall to enhance your ceremony and head table staging areas. Hang crystals from branches. Wrap small white lights around the trunk and branches for an added lighting effect. Supplies to make your crystal wedding trees can be found at your local craft stores. Ask your local nursery for recommendations on purchasing live plants. After all, you want them to look great throughout the entire evening and be able to support the numerous crystals you hang on them. For those who are having trouble creating just the right look when learning how to make crystal wedding tree decorations, there are options. Instead of making the tree yourself, meet with your florist and ask him/her to create one for you, or ask your wedding planner for recommendations on where to buy pre-made crystal trees.You can also choose to rent crystal trees from local wedding and party supply shops. Even if you cannot create your own tree, you can find someone who will make the design of your dreams to add subtle sparkle to your special day.